Berlinale Festival Director Dieter Kosslick and Culinary Cinema head Thomas Struck officiated the start of the 69th Berlin International Film Festival when they welcomed the media and five enticing food trucks on Wednesday, February 6th, the day before filmmakers and celebs will hit the red carpet for the world premiere of Lone Scherfig's film The Kindness of Strangers. The sun was shining, somewhat of a rarity for Berlin winters, and the food looked and smelled delectable, especially the Korean food truck from Fräulein Kimchi, the Mexican street food from eddielicious Berlin and the authentic Italian pizza from newbie Berlinale food truck Zero Stress Pizza. 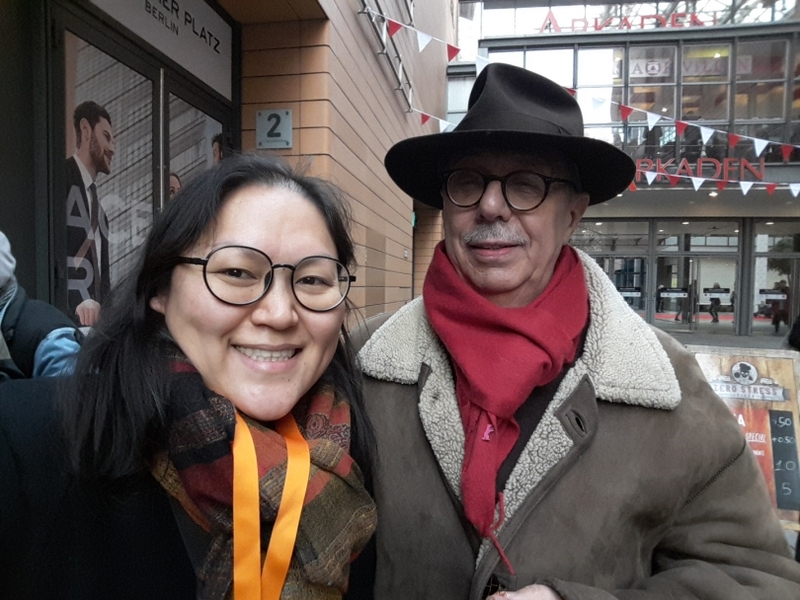 Last year during Berlinale I ate at the eddielicious Berlin food truck and chatted a bit with the owner, Edgar "Eddie" Bork. He and his food were just lovely. Bunsmobile food truck was also serving up some tasty looking burgers and fries today while the Heisser Hobel was busy dishing out some serious-looking käsespätzle, which is pretty much Southern German-style mac and cheese. When käsespätzle is done right it's something quite special, not any ordinary mac and cheese. Berlinale Street Food is in cooperation with Bite Club Berlin and Slow Food Berlin, so we can all thank them for bringing these amazing, talented and super tasty food trucks to the festival. Filmgoers get hungry, so what better place to grab eats between films than a food truck whose staff is super friendly and raring to go? Director Kosslick was leaving all that taste tests to his colleague Struck who really didn't seem to mind. Kosslick did partake in some Korean hot ginger tea, which was just what the doctor ordered. Somehow among the swarm of German journalists and photographers snapping away I didn't quite catch why it was exactly that Kosslick couldn't eat any samples, it might have been that he was just too amped up or perhaps for some health reasons. My German listening skills were put to the test and with the loud noise of the snapping of cameras I failed miserably. I feel like I still understood enough of the chitchat between Kosslick and each food truck owner. One funny language mix-up was when Kosslick asked if the Italians (2 Sicilians and one from another region) if they were from England. The Zero Stress Pizza staff simply said that they only speak English, no German but Kosslick thought they meant that they're English speakers from England. He even joked that the female chef with dreadlocks looks like she's from England, whatever that means. After that confusion, the conversation shifted to their ingredients. They assured Kosslick that they use only real cheese, mozzarella and their ingredients are shipped in from Italy. Let's hope that the German journalists listening in didn't leave confused, thinking that none of the pizzamakers come from Italy. That would be pretty badpublicity, advertising a pizzeria run by three Brits. Kosslick seemed to have a very special relationship with the owner of the Heisser Hobel truck because he presented him with a really chic and expensive looking scarf. The most anybody else got from Herr Kosslick was an official Berlinale 2019 bear pin, which he pointed out is hard to replicate since it has sparkly glitter within setting. I was one of the lucky ones to receive such a pin. As Kosslick was leaving the food truck street he applauded loudly as Lauren Lee, classical trained opera singer and now owner of Fräulein Kimchi food truck and catering, serenaded a few of us with a little song at the prompting of a German journalist. Speaking of Fräulein Kimchi, I waited around a bit to try to get a short interview but gave up as she got busy serving up some grub to the masses. Instead I went to pick up my press pass and once I came back I was able to catch Ms. Lee for a brief interview. Her story is quite an interesting one. She was born in South Korea and was raised between Chicago and Toronto before ending up going to school in Los Angeles. Originally she came to Germany to continue opera studies, which seemed to go well because she stayed on after her studies. In 2010 she started selling her homemade kimchi around the city, just by word of mouth. She even believes that she was the first person to sell homemade kimchi in the city; that's a pretty big feat. She mentioned that, "eleven years ago Korean food was pretty much nonexistant" (in Berlin), not like it is now. Lee notices that at least two or three new Korean restaurants seem to sprout up each year. That's pretty big, especially when the restaurant industry can be so competitive. It wasn't until 2013 when Lee, as a side gig to make some extra cash, opened up her first food stand in Markthalle 9 while also catering for private parties. For about a year she had Fräulein Kimchi active as a restaurant but when her catering business took off they needed that space entirely for food prep. Meanwhile she and her Fräulein Kimchi team were traveling around Germany and Switzerland selling their Korean-inspired fare. Don't worry though, festivalgoers Fräulein Kimchi will be serving more traditional Korean food, not any of the kimchi tacos or kimchi käsespätzle that she's served at other events. Berlinale 2018 was pretty much the first big event where she got to put her food truck to use and that was just because another food truck bailed at the last minute so she took her shot. She had a little extra pep explaining to me, "It was super successful last year, way better than I could have ever...every day I was like 'we need to make more kimchi!' " Although Lee might not be professionally trained as a chef, she probably had the best schooling that's around - learning from her Korean aunties. "I learned it all the hard way," she said with a laugh. She said that she really knew that she made it when both of her parents told her that her cooking tasted great. Families, particularly Korean families, tend to be very direct and tell it how it is. The menu has remained the same as last year, with the bulgogi "beefy" bowl with a fried egg on top being the big crowd-pleaser. Of course beefy is in quotes because Lee's food truck at the festival isn't selling any real meat, instead using tofu as a substitute. We laughed a little about how she treats the tofu like a real ingredient, a real protein so it really gets almost a meaty flavor and texture to it. She thinks that many customers don't even realize that it's not meat. All in all, things look promising this year at Berlinale Street Food. The food trucks and their staff were full of energy and very excited to feed the film-loving masses as Berlinale officially kicks off today, February 7th and runs until February 17th at various cinemas around Berlin.